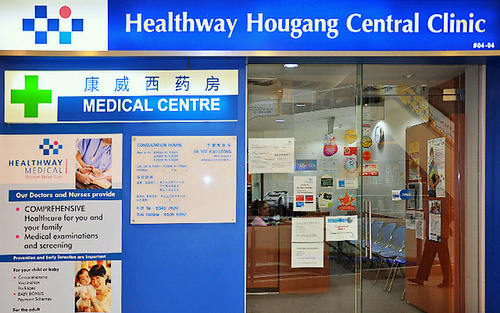 Healthway has a total of 49 family & general practice medical clinics in Singapore, including one within Hougang Mall (90 Hougang Avenue 10). The group has one of the largest networks of private medical centres and clinics in Singapore, each offering high quality, affordable services across primary healthcare, dental, and specialist services. If you’re a tourist or an international resident in Singapore, one of Healthway’s focuses is on catering to the needs of international medical clients. There is even a Healthway Japanese Medical and Dental Centre, located at The Centrepoint mall (176 Orchard Road). …Nobel Eye & Vision Centre (ophthalmology), Island Orthopaedic Consultants (orthopaedics), Nobel ENT Head Neck & Thyroid Surgery Centre (otorhinolaryngology), Nobel Psychological (psychiatry), Nobel Chest & Internal Medicine Centre (respiratory & internal medicine), and SportsMed Central (sports medicine). The group’s dental services, meanwhile, are operated under the Healthway Dental (www.healthwaydentalgroup.com) brand. To read more about the available family / general practice medical services available from Healthway, the best resource is their official website, at www.healthwaymedical.com. For the specialist medical services, meanwhile, you can browse www.healthwayspecialists.com, and for the dental services, see www.healthwaydentalgroup.com.